The 2017 AWFS Show (July 19th-22nd) promises to be an exciting opportunity to visit Las Vegas and see the very latest technology from Thermwood! 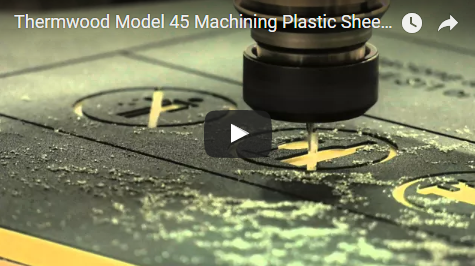 Like the award winning Thermwood Cut Center (make virtually anything a cabinet shop would want to make - with no programming) and the powerful and versatile Model 45 with a pod system (machining solid wood, plastic and aluminum). SAMPE 2017 is Right Around the Corner! Thermwood will be featuring our new Large Scale Additive Manufacturing (LSAM) system showing videos along with finished parts. 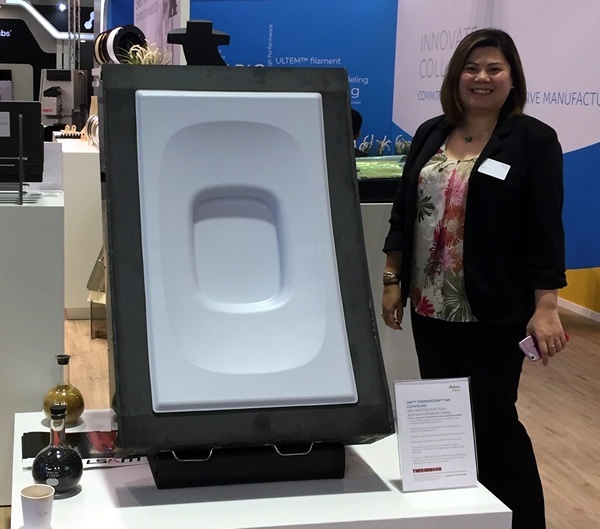 The LSAM is a one of a kind system that features a print gantry for printing a variety of materials including ABS,PPS and ULTEM with carbon fiber and a trim gantry for the subtractive process. 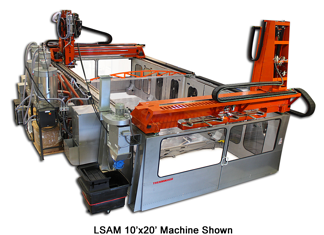 The LSAM is used for the production of tooling, molds, masters, patterns, fixtures and plugs used in a variety of industries including aerospace, automotive, boating, foundry and thermoforming. 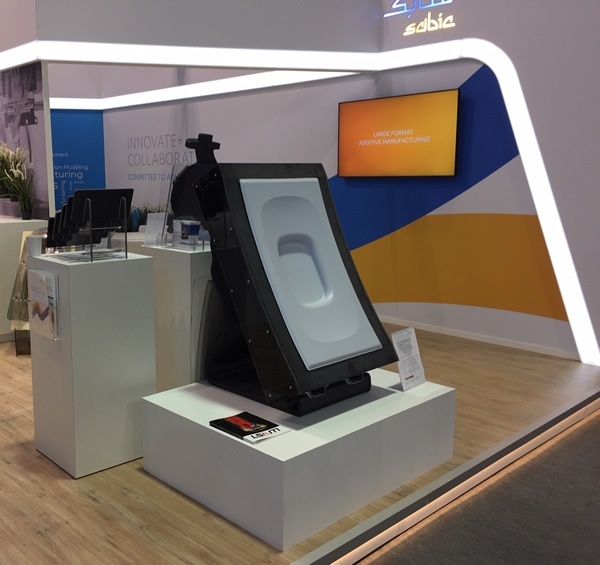 Thermwood will also feature our new three axis APM system for machining and automatically inserting potted fasteners for the satellite industry. 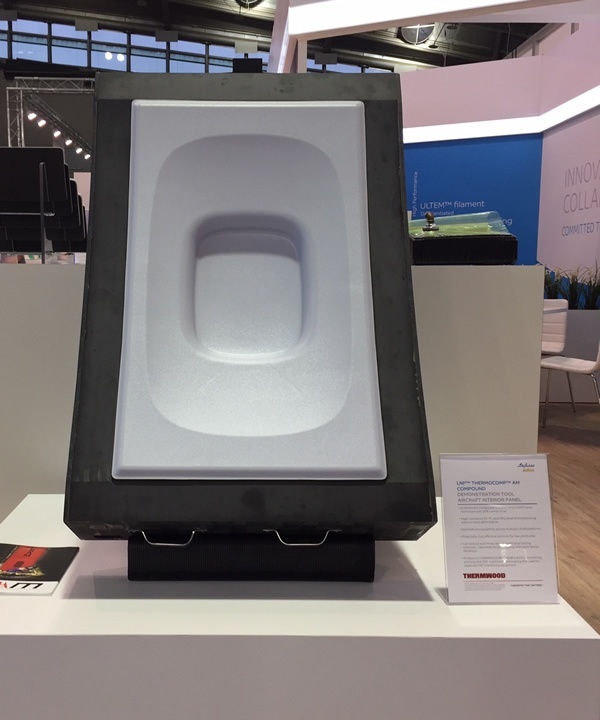 This new system was brought to the industry in conjunction with RUAG Space. The APM system machines and drills the panels, then automatically inserts the fasteners using a patented approach. 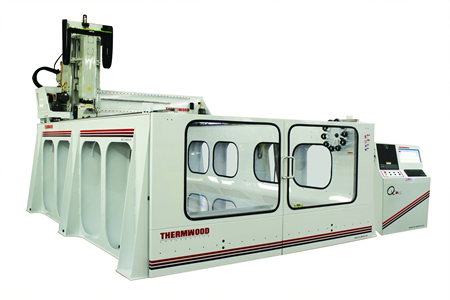 Of course we can’t forget the Thermwood line of three and five axis CNC machining centers. We have a large variety of different sizes and configurations ideally suited for the production, fabrication & trimming of wood, plastics, non-ferrous metals, composites and other advanced materials. These applications range from machining patterns and molds/plugs to trimming & machining production products for various industries such as woodworking, automotive, aerospace/aviation, military/defense and many more industries. Although we won’t have any machinery at this event, we will have videos and parts for touch and feel. We will also have representation there to help with any questions that you might have. Thermwood is a US based company with dealers and distributors worldwide. 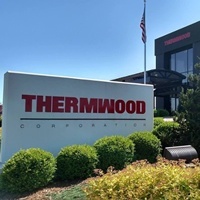 In addition to machine manufacturing and software development, Thermwood has a technical service organization that provides support, machine installation, training, retrofits, custom programming and production assistance. Please visit www.thermwood.com, call 1-800-533-6901 or email info@thermwood.com for more information. 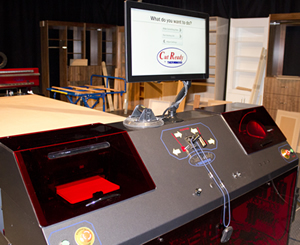 Get Hands-On Experience with the Thermwood Cut Center at IWF 2016! The 2016 IWF Show (August 24th-27th) promises to be an exciting opportunity to visit Atlanta and see the very latest technology from Thermwood (booth #6513)! 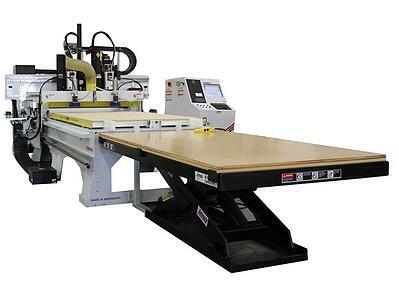 Like the award-winning Cut Center (make virtually anything a cabinet shop would want to make - with no programming), the all-new Framebuilder 48 (for nested-based upholstered frames featuring an auto load/unload system and built-in chip collection hood) and the heavy-duty Model 45 utilizing pods and aggregate tooling (machining solid wood parts). Try out the award-winning Cut Center for yourself at IWF 2016! 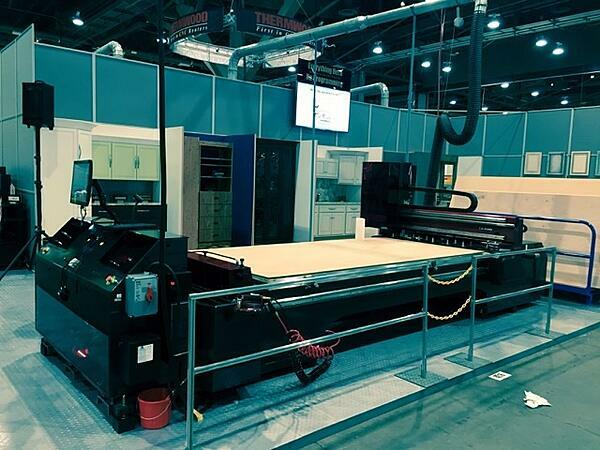 The award-winning Thermwood Cut Center (which can be operated as an easy-to-use Cut Center with no programming, or as a traditional CNC router - running programs generated with virtually any CNC software) will be in action during IWF 2016. You'll have the opportunity to see just how easy it is to run this powerful machine. Just tell it what you want, and it makes it...it is that easy! We'll be demonstrating live during the show, and you can be part of it by helping to operate the cut center. 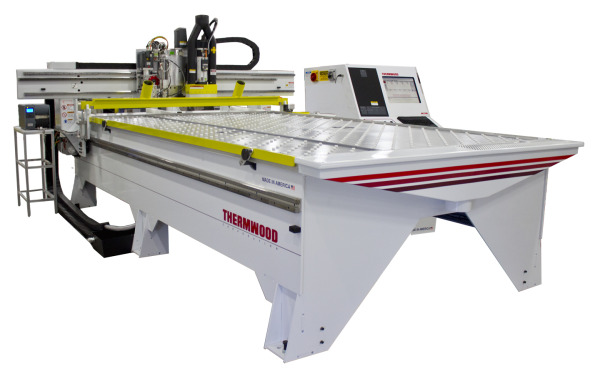 Please visit our booth (#6513) and speak to a Thermwood representative to get your hands on this exciting machine! 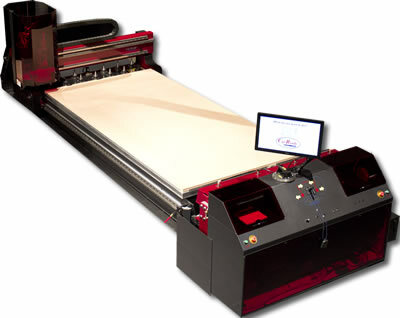 Thermwood is also proud to demonstrate our all-new FrameBuilder 48 (4'x8' table) CNC router equipped with optional dual 18 HP Spindles and dual electric drills for nested based upholstered frame production. Featuring an auto load/unload system to automate the process of feeding the machine sheet material and automatically off-loading the parts upon completion. The system is also equipped with a built-in chip collection hood that cleans the table as it executes the automatic load/unload cycle. The FrameBuilder 48 will be in action at IWF 2016 in booth #6513. 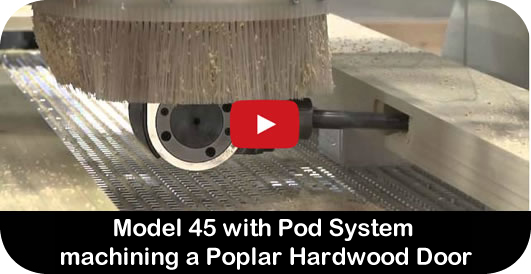 We will also be demonstrating solid wood door machining utilizing pods and aggregate tooling on the Thermwood Model 45. All three of these machines will be on display and cutting live at IWF 2016 (August 24th-27th) in Thermwood booth #6513 at the Georgia World Congress Center - Atlanta, GA. Make plans now to visit us and see this exciting new technology in person! 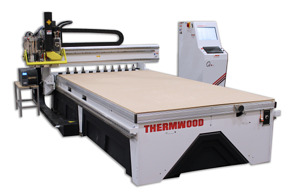 For more info on the Thermwood Cut Center, please visit cutready.com. 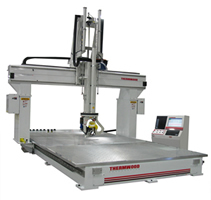 For more info on the FrameBuilder 48 or Model 45 CNC routers, please visit us at thermwood.com. See the Award-Winning Thermwood Cut Center at WMS Toronto! The 2015 WMS Show (November 5th-7th) promises to be an exciting opportunity to visit Toronto and see the very latest technology from Thermwood! 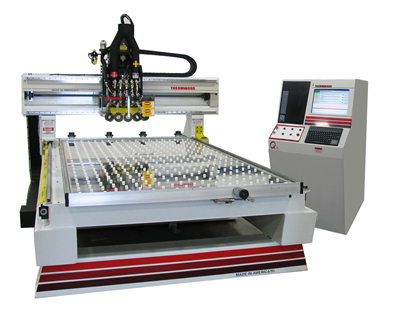 Like the award winning Thermwood Cut Center (make virtually anything a cabinet shop would want to make - with no programming), as well as the AutoProcessor 5'x10' (a high-speed, automatic load/unload, heavy-duty CNC routing system for nested based feed through machining). Please come and visit us at CNC Automation booth #2013. Click this link (use promo code CNCAUT15) to obtain passes to the show on behalf of CNC Automation (exclusive Canadian Thermwood dealer). 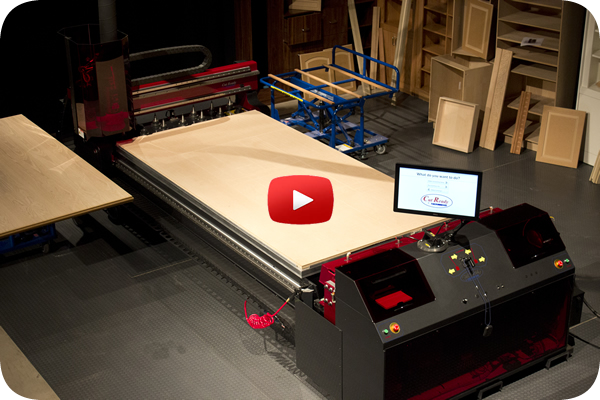 If you want to operate the Cut Center as a CNC Router, you can. 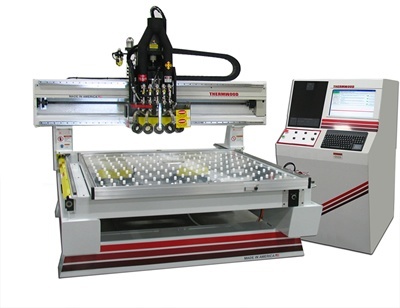 With CNC Access, you can operate the Cut Center as a CNC router in the traditional manner, running programs generated with virtually any CNC software. Plus, (using eCabinet Systems software and following specific design protocols), you can custom design products and add them to the Cut Center libraries and then those items can be machined by the Cut Center with no further programming. The AutoProcessor 5'x10' is a high-speed, automatic load/unload, heavy-duty CNC routing system for nested based feed through machining. It is used in nested based production of cabinets, closets and custom furniture. 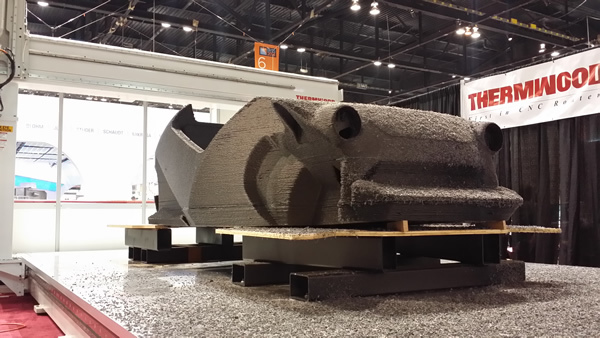 Thermwood participated at the 2014 IMTS (International Manufacturing Technology Show) in Chicago, as a part of the world's first 3D printed car team. 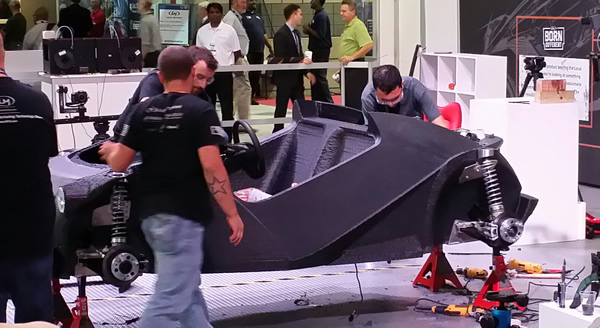 This ambitious undertaking was conceived by Local Motors localmotors.com and carried out by several partners on the project, including Thermwood. 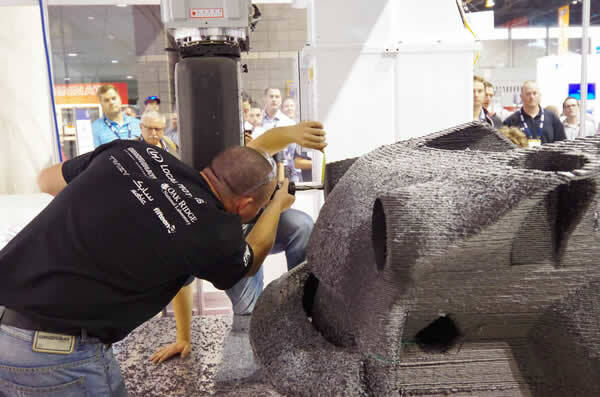 The overall concept was to 3D print, trim, assemble and drive the car all in the one-week time frame of the IMTS show in front of the over 100,000 attendees during the week. 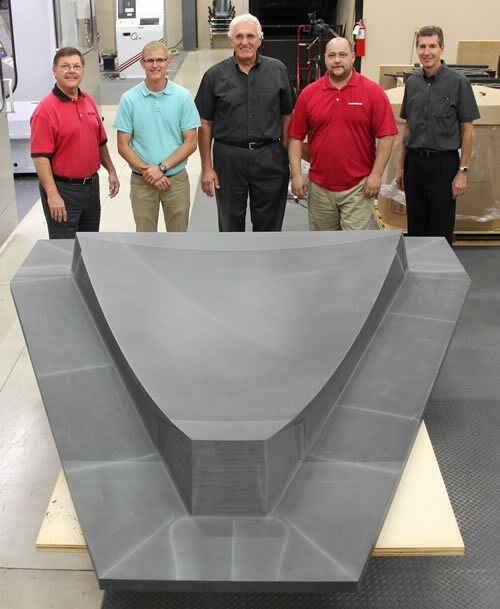 After the car body was 3D printed (the additive portion of the process using a Cincinnati Big Area Additive Manufacturing machine), a Thermwood 5 Axis Model 70 10x15 CNC router was used as the subtractive portion to trim and shape the body into the final streamlined version. This process had to be precise to achieve the correct fit and finish of the body, fenders and all other parts. Overall, the entire 3D printing process took 44 hours, machining on the Thermwood took one full day and final assembly was two days! After assembly, the finished Strati was ready to roll, and was driven on the last morning of the IMTS show on Saturday September 13th. 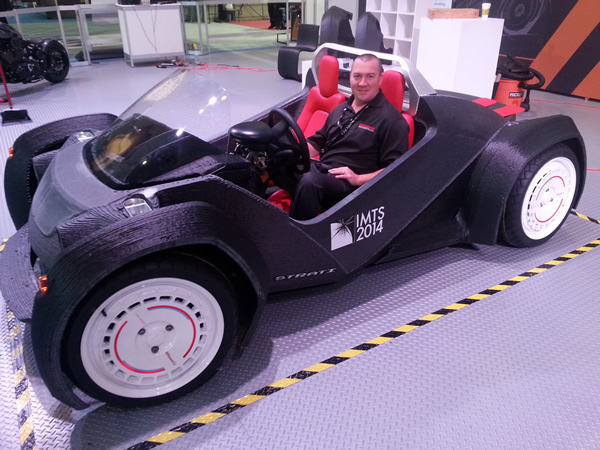 This World's First 3D Printed Car begins a lengthy international tour this week. Local Motors CEO John B. Rogers Jr. (Jay) says in a press release "The Strati was designed by our community, made in our Microfactory and will be driven by you, This brand-new process disrupts the manufacturing status quo, changes the consumer experience and proves that a car can be born in an entirely different way." 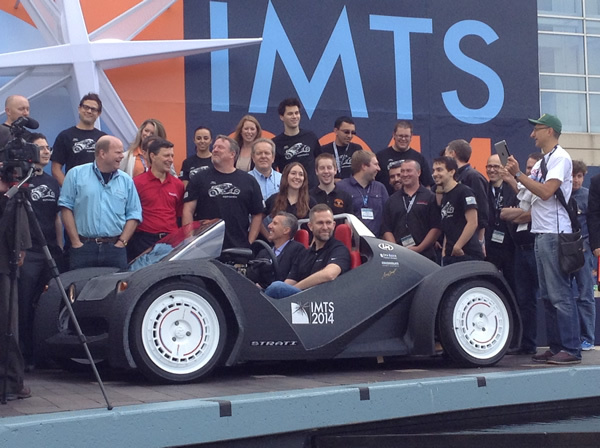 The project team presents the finished Strati to the world right before its first drive! Just like a smart phone does more than make phone calls, a “smart-router” does more than route parts. The “more” in a smart-router saves material and labor and makes it really easy to use. A smart-router may cost more but is substantially more profitable, making it a much better overall investment. Thermwood would like to invite you to visit us at the JEC Americas Trade Show in Boston, MA. 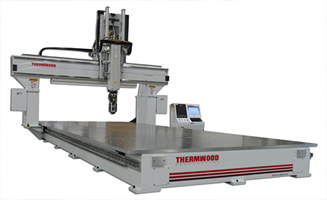 We are exhibiting the latest Thermwood equipment:- Featuring our newest 5 Axis CNC Router - the Thermwood Model 77. For a limited time, you can receive a FREE Visitor's Badge to attend the show free of charge - act now to take advantage of this offer!